CompTIA Security+ SY0-401 is a popular certification within the IT field. One IT hiring manager told me that if a résumé doesn’t include the Security+ certification, or a higher-level security certification, he simply sets it aside. He won’t even talk to applicants. CompTIA Security+ SY0-401 is one of the options for certifications required by the U.S. Department of Defense for military personnel and military contractors engaged in information assurance activities. Having this certification makes you more marketable for these types of contractor jobs, which can be very lucrative. All that is required for you to take the exam is money. Other than that, there are no enforced prerequisites. However, to successfully pass the exam, you’re expected to have at least two years of experience working with computers in a networking environment. If you have more than that, the exam materials will likely come easier to you. If you have less, the exam may be more difficult. There isn’t any guaranteed path to passing the Security+ SY0-401 exam. However, the following steps outline the path that thousands of people have used to add the Security+ certification to their resume. Get a good study guide. 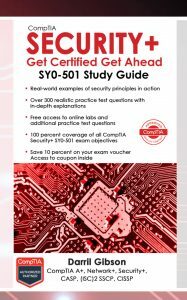 The CompTIA Security+: Get Certified Get Ahead: SY0-401 Study Guide has a wealth of practice test questions and gets great reviews on Amazon. You’ll see the performance-based questions first and they take much longer than typical multiple-choice questions. If the answer is clear to you, then by all means, take the time to answer it. However, if the question isn’t clear, mark the question and skip it. You can come back to it later. It’s entirely possible that the question is a poorly worded beta question that doesn’t even count. However, if you spend 45 minutes on it, you might run out of time before you finish the multiple-choice questions.